MARIETTA, Georgia (Aug. 30, 2016) — A capacity crowd of real estate investors and other bidders packed into the John Dixon & Associates offices last week, while dozens more watched and bid online for commercial properties, land, homes and other real estate. 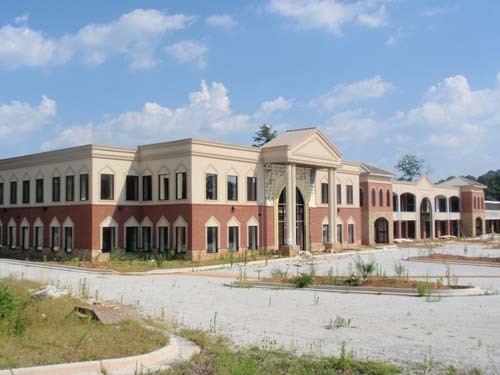 A partially complete retail and medical office building on Marietta’s Powder Springs Road sold for more than $1 million. Also selling were two motels across the street from each other in Wayne County, Georgia. “There’s a lot of demand, and that was reflected in the number of bidders both live and online. Our simulcast bidding has become so popular that these are often the same group. It’s not unusual to have someone stop by the office on the auction day to pick up some materials and then go back to their office or home to bid,” said John Dixon, president of the auction company. Dixon said the company’s Multi Seller auction format, which features properties from a number of sellers, is growing in popularity with sellers and buyers alike. “As in previous Multi Seller events, we had several banks, some individuals, and institutional investors who sold property throughout the Southeast. Bidders like it because they have more properties to choose from,” said Dixon. The company now turns its sights to Puerto Rico, where the company will conduct an auction of approximately 40 properties on September 10. Individuals seeking more information on that, or on selling assets in the company’s auctions, may visit www.johndixon.com or call 800-479-1763. John Dixon & Associates, based in Atlanta with offices in Florida, North Carolina and South Carolina, is one of the nation’s largest auctioneers of real estate properties, including land, residential, commercial and industrial properties.